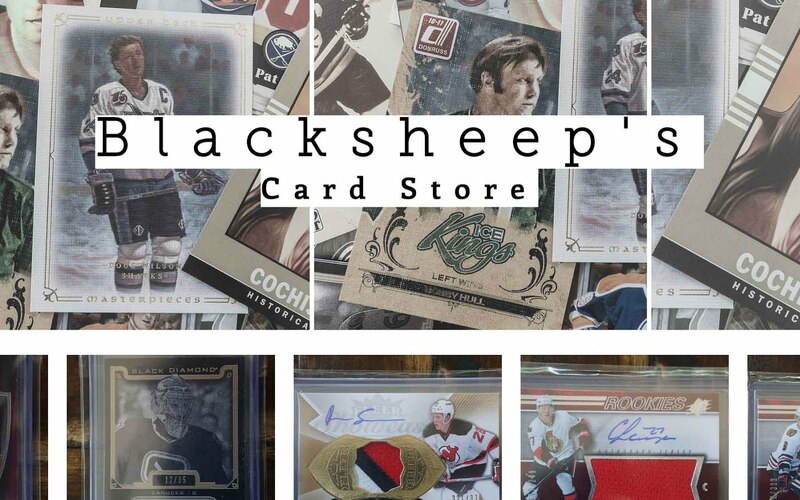 Upper Deck releases Fleer Showcase today, and its a set full of nostalgia. They have crammed in memorable inserts and card types from Fleer, Skybox, Ultra, and more. For fans of these cards, it's a pretty cool walk down memory lane. Collectors unfamiliar with cards from that era can still enjoy the sweet and colorful designs that made them so popular with collectors back in the day. 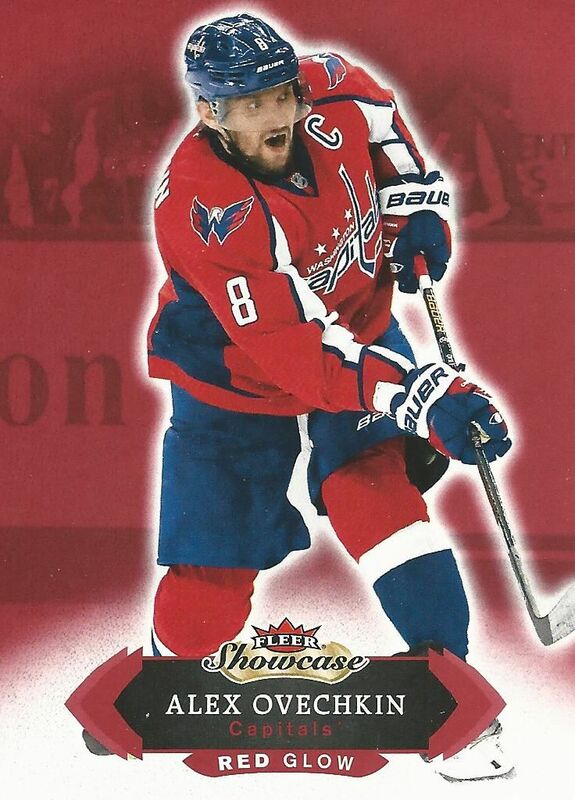 The base cards in Fleer Showcase are not my cup of tea. They remind me of a slightly duller version of older Ultra Gold Medallion parallel cards - which I didn't like. 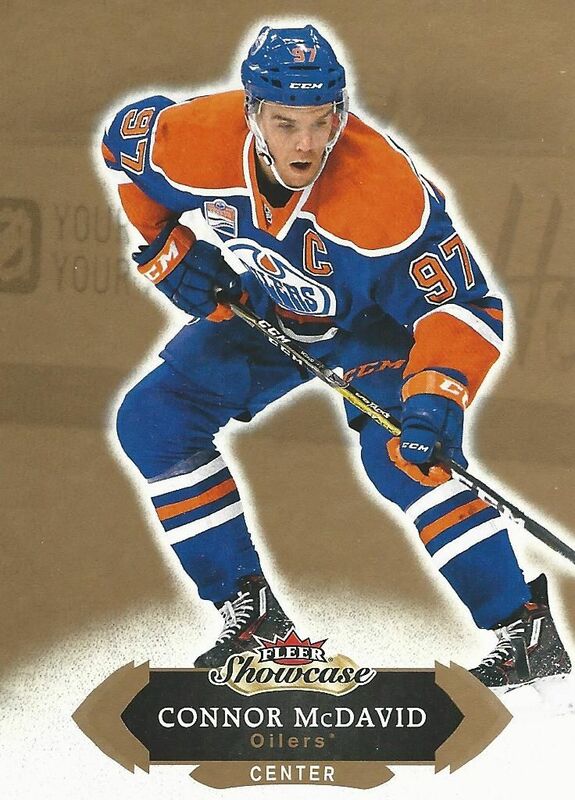 The copper/gold background just doesn't look good with hockey. I really wished Upper Deck chose a different brand like Skybox or Fleer to create base cards from. The Showcase base design is just unpleasing. From the scan above, you may think it is covered in gold foil, but in looking at it in-hand, the card is really flat without much texturing to enhance it. There really isn't much to like with this design. This is not a base set I would consider trying to complete. The back of the base card is quite nice compared to the front. There are multiple design elements incorporated here. I especially like the graphical frame used for the player photo. The entire back, in fact, is very thoughtfully put together. Rarely do I like the back of the card more than the front, but this is a case in which that is true. The rookies in Fleer Showcase are called Hot Prospects. 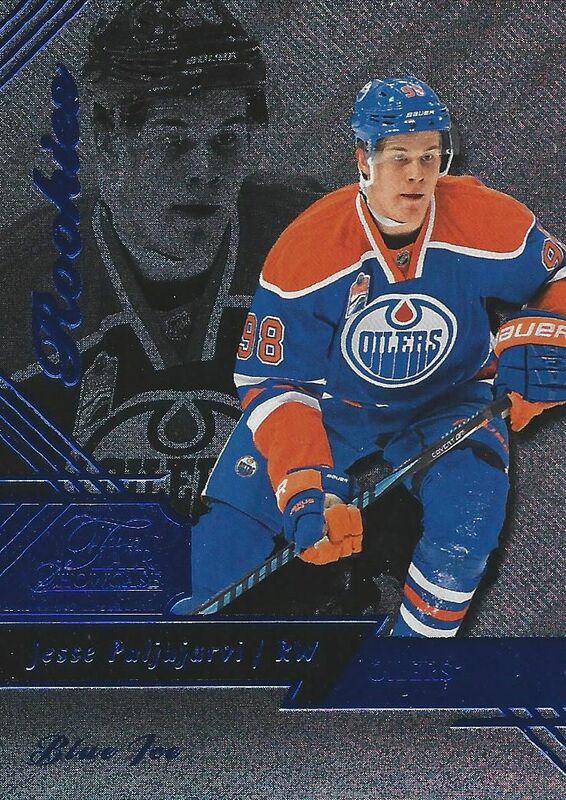 There are a variety of different rookie card types to be found in the main set. Some feature multiple players, some feature autographs, and some don't. The bigger name rookies will likely be found in the autograph crop. 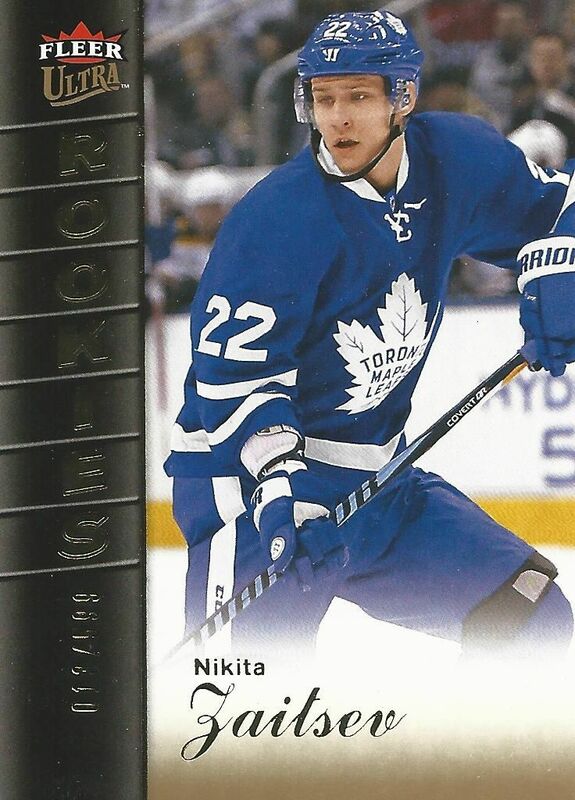 Lower level rookies like the Nikita Tryamkin I pulled are numbered to 499. Rookies like Patrik Laine and Mitch Marner are numbered to less than that. They are numbered 299 and 99 respectively. 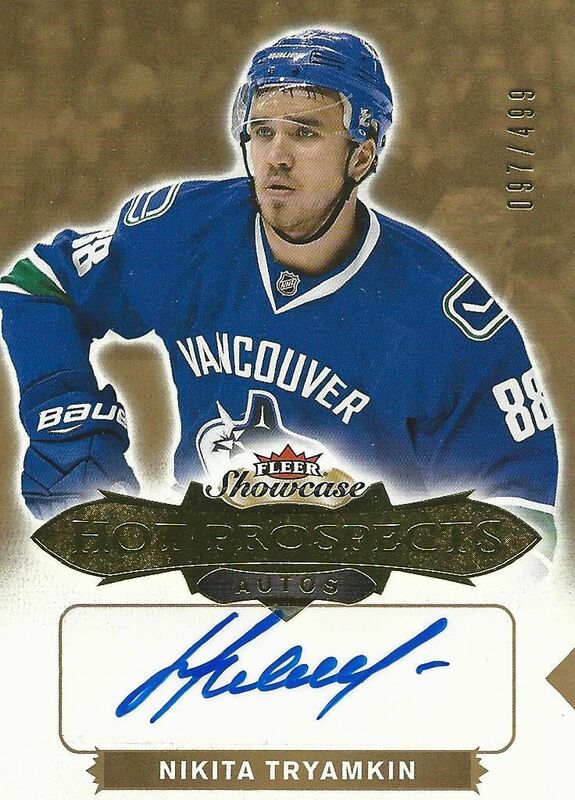 The Tryamkin I pulled was a sticker auto, but the sticker has been applied very nicely as the sticker blends well with the card making it look like a hand-signed card. Boxes of Fleer Showcase come with 18 packs with 5 cards per. In the box you are guaranteed one autographed card and a whole bunch of insert from Fleer brands of old. Boxes of Showcase are well under a hundred dollars. 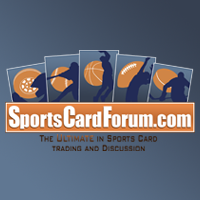 So if you're looking to get more cards for your buck, this would be a nice choice. I received a few of these Red Glow parallel cards in my box. Like its name suggests, there is a red theme to the card. Replacing the hideous gold color is this matte red color. It doesn't glow... but these cards are a lot better looking than the base cards. These parallels make me wish that Upper Deck had gone with just about any other color than the gold they chose. Red Glow cards aren't too hard to find, there is a rarer parallel called White Hot that also exists. White Hot cards are numbered to just 25. The card that stood out to me the most was this EX2017 insert card. It is meant to be like the EX2000 cards from the past. Upper Deck did a very nice job on replicating the card, though this feels thinner and flimsier than the originals. The foil really makes the card pop, and the see through background behind the player is pretty cool to see in person. 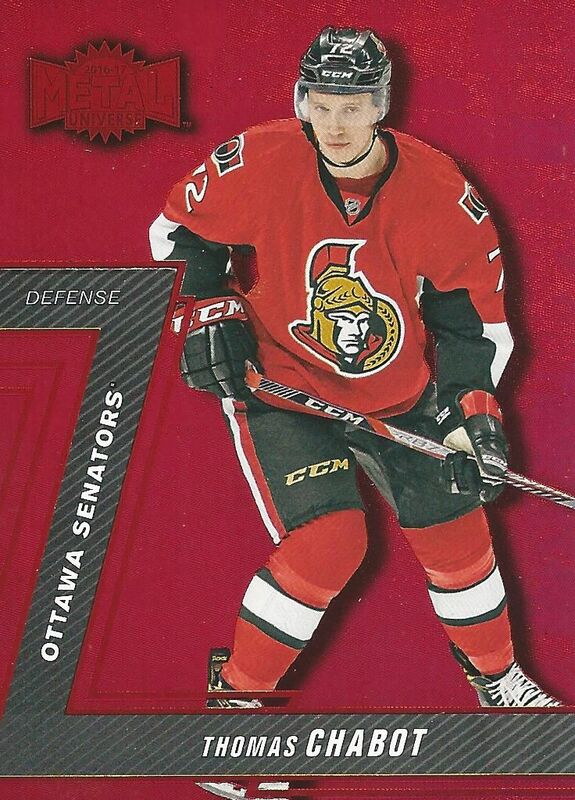 Though its a repeat of an older product, I'm glad to see cards like this back in packs. 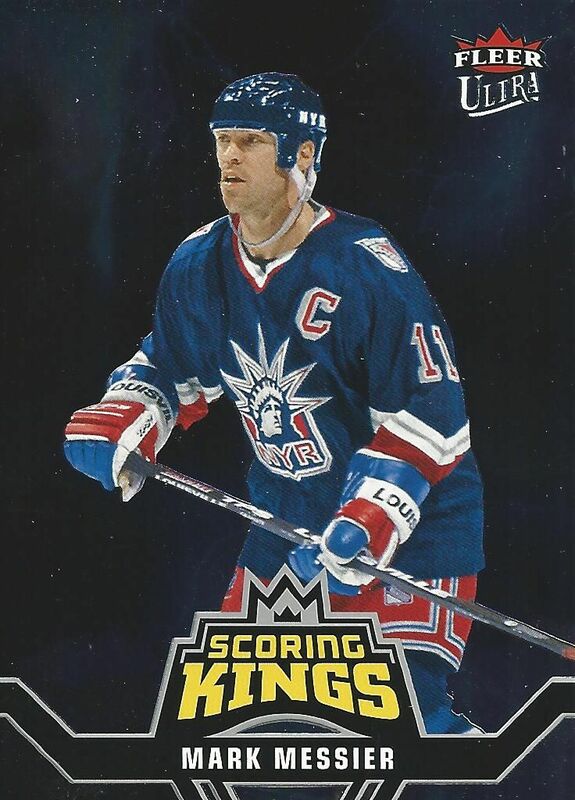 Another insert from yesteryear is this Scoring King card I pulled. 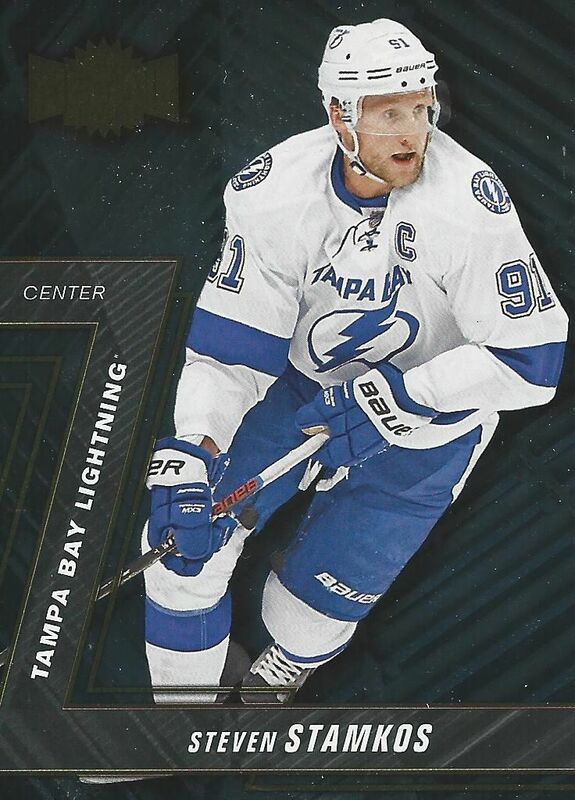 It's tough to tell in the scan, but there is lightning in the background of this all foil card. In person, this card looks very nice - again, not quite the quality of the original versions, but a good attempt still. I got a couple of these cards in my box so they are not rare, but I chose to show off this Messier because I like seeing the Lady Liberty Rangers jersey back on cardboard. Those era of jerseys were not well liked... but everything old can be new (and popular) again! Continuing on with the retro goodness are Flair Showcase inserts. Flair Showcase was a super premium card set on very thick card stock. Each card was fully foiled and looked stunning. I remember buying each pack that looked like a cigarette box. They were a thrill to open. The card above is Blue Ice parallel numbered to 199. It's a very good looking card with the foil having a sparkle to it. From Fleer Ultra we have Fleer Ultra Rookies. I guess this is just a way to add more rookie content to the set already full of rookie content. Because this card isn't foiled, it does seem a bit lackluster in comparison to the other cards. It does, however, feature serial numbering to 599. Medallion variations of this set are also available either numbered to 99 or just 25. A hugely popular set (especially in basketball) was Fleer Metal. These cards were a little like Black Diamond in that they were thin cards that featured radical foil designs. The design of these cards is definitely busy and has a good look to it. I'm not jumping out of my chair, but I'd have to say these cards are well-done. The Fleer Metal cards I got in my box all featured the same design. I think it would have been better if they really went for it and gave individual Metal cards different designs. But that would have probably been too much work for a set like this. I did end up getting a Precious Metal Gen, or PMG, in my box. It's just a red numbered to 150. This card looks very nice though as the foil has a special shimmer to it. I'm sure all the PMGs do this. I definitely wouldn't mind having more of these, but they may be hard to find and afford as PMGs can sometimes take off in value. If you're interested in why these PMGs are so popular, go onto eBay and see the prices for some of the original PMGs. They can be insane! I thought my box gave me a nice variety of cards, but there is so much more to find in Showcase. One card I wish I pulled was a Hot Glove insert. I'm sure they are not like the thick originals, but I think getting one of those die-cut cards would have been fun. Upper Deck has also put in buyback original Fleer Ultra cards. I really want the Pat Lafontaine buyback! I saw one on eBay but the asking price is way too high! Maybe I'll wait till it drops. I wasn't sure what to expect when Fleer Showcase came out today. The past few years have had it spit out patch autos at a one-per-box rate. This year Upper Deck has held back on those and featured non-hit insert cards much more prominently. I actually like the change quite a bit. I really love the older insert designs and brands. Hopefully the PMGs will be popular enough that people will want to buy more and more of this product. I think PMGs should be valued at higher prices than they are currently. For hit collectors, this may be a tough buy because you only find one autograph per box. It may not be enough to satisfy those folks. For me, I thought that was ok because at least UD guaranteed me something along with all those insert cards. I really enjoyed Fleer Showcase. There are really great looking cards in this set (besides the ugly base cards) that I hope can raise in value. The days of the high dollar insert card may be over... but that could just be for now. I'm happy with how Fleer Showcase came out. I certainly recommend a box just for the pure joy of it. There's a lot of fun to be had with Showcase and I'm glad UD did it the way they did. I never got into fleer showcase but this year im giving it a shot. ordered 3 boxes so im hoping i will get something nice. looks like a fun product to open!!! This is a good product for new collectors. I am always a fan of getting an insert/rookie/replica or auto in a pack! However it decreases the value of the inserts! I doubt the rookies of this product. Such as Laine, Marner, Matthews and Tkachuk will be worth much! Overall I like the product and would love to win a card!! got a couple packs was fun to break glad you liked it too! Awesome that you get an insert or something in each pack! That auto wasn't that great but still a cool product. A lot of hit and not to expensive.Overall,Nice box. Fleer has never been something I've been too interested in, but this year I think they did a pretty good job. The inserts look really cool. Overall its a really good box. From this product you are getting a good amount of numbered cards and a guaranteed auto. For the price, it's definitely worth it! Wished they kept the patch per box with higher price point! Nice review as always! Great review. Those base cards are quite ugly. Nice Zaitsev though. Ahoy there, I enjoyed the colourful cards in this review. Yeah the base doesn't scream "collect me". Surprising they are prices sub 100 in Canada too. Thanks for your work! great review, i agree with you on the base cards not being visually appealing. Nice Puljujarvi! Nice Break and I do not agree with you on the base cards. Love the Puljujarvi Blue Ice and the Larkin EX! cool box,really like your review,the base cards are kind of lame but the rest is awesome! Right on! 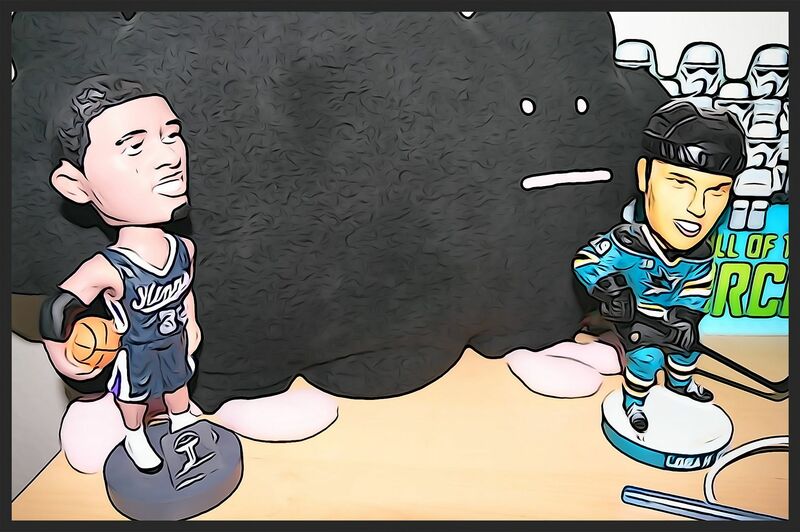 I'm a fan of this, and of any chance at some Laine cards! very detailed review. I'm not a big fan of the base design as well but the inserts look really nice. Really liking the EX design. Keep up the great work! Looks like a fun break. I will be trying my luck on it. Like the Nikita Tryamkin auto. TRAM! Nice pull on the Tryamkin auto! Overall, pretty nice break there Luke! Solid array of PMGs and rookies throughout the box. Thanks as always for the opportunity! Nice review! Don't really like the design, but there's quite a few nice Penguins in there. I always thought this was a nice product. Only if they brought back a better fleer ultra product though. Nice product and super review as always!!! 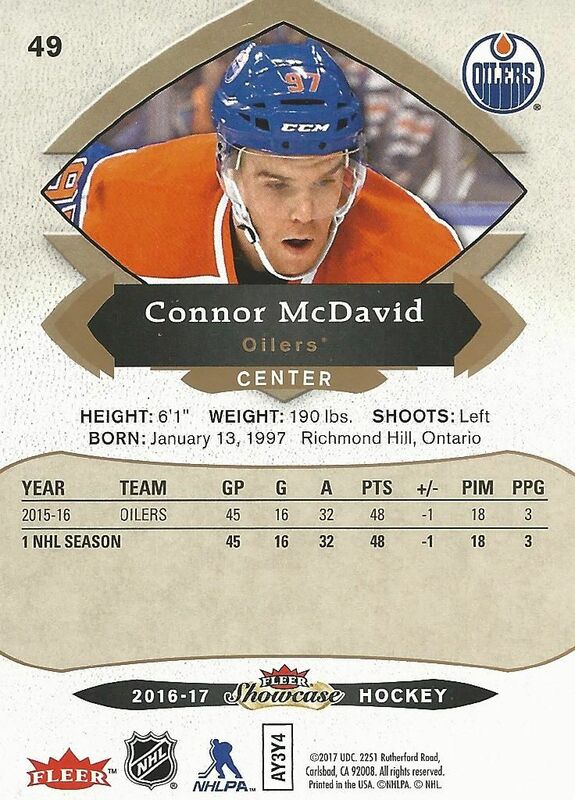 Cards look decent and inserts are interesting. When I got an EX2017 card my pack had only 4 cards, was it the same for you?